Lisa loves John: A Summer Salad! Ok, I have to say it... July is half-over - does anyone else find this absolutely crazy?! Since John and I moved to Arizona, we've been in full-on grilling mode. And let me tell you, it's fabulous... basically zero clean up, everything tastes great, and it's so dang easy! We've been working on incorporating sides with our meals (we are still beginners at this...), and I stumbled across a yummy summer salad that I had to try. 1. Begin by grilling the corn, and then cutting it off of the cob. 2. Chop about a 1/2 cup of cilantro, about 3/4 cup of tomatoes, and 1 avocado. 3. To make the dressing, mix together the fresh lime juice, honey, oil, garlic, and cayenne pepper. 4. 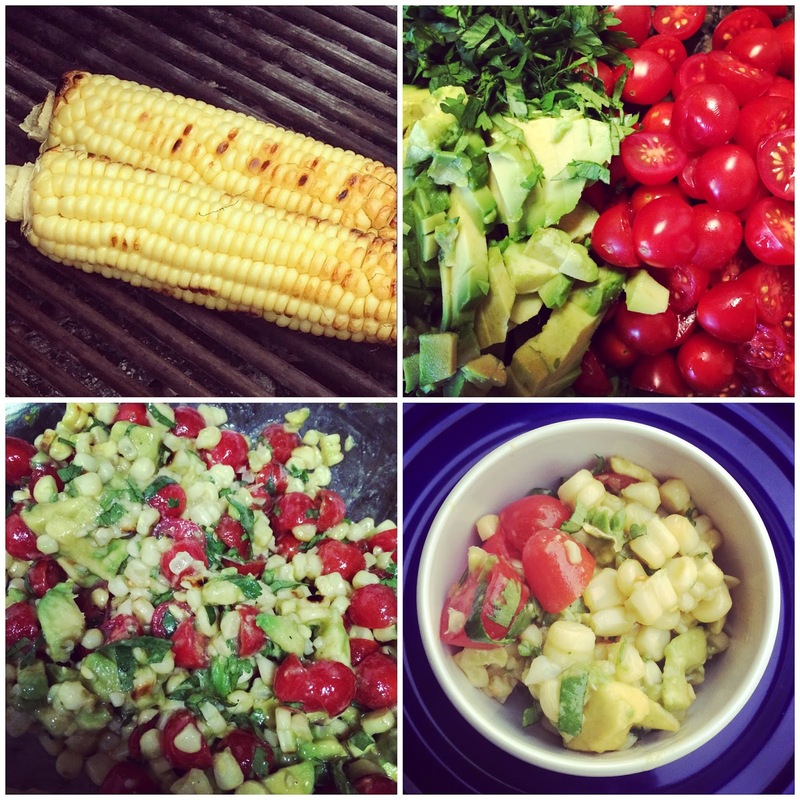 Toss the corn, cilantro, tomatoes, and avocado with the dressing and chill before serving. This sounds delish!! How many servings does this make? summer is just flying by, needs to slow down! this salad looks so yummy and easy, i wish we had a grill, its the perfect way to cook in summer! Yum! I've had something similar to this and its delicious. I love grilled corn!! I love grilled corn, I think I'm going to have to try this!! It does seem perfect for summer! That salad looks delicious and refreshing! This sounds so good! I love salads that don't include lettuce or greens- especially in the summer-- that grilled corn sounds amazing! We have so been on a corn kick. I'm totally making this!! This is one of my favs! Especially with how h-o-t its been! That looks so good! I will be trying that this week! This sounds AMAZING! I need to make it ASAP!! Sounds delish! I wonder if I can get the hubby to eat this! I am always looking for new corn recipes because since he grew up on & around farms he is not a huge corn fan anymore because it ate it so much as a kind. Unfortunately for him, I love it, so I am always looking for new ways to make it! This is my kind of salad! And seriously, where is this summer going?! It needs to slow down already!! There's really nothing like grilled fresh corn! It's up there with fresh pineapple instead of canned; no comparison! We grill year round around here. It's the best! I'm so used to indulging in full ears of corn smothered in butter that I never thought to make a little salad out of it. Yumm, this looks delicious! We grill a lot in the summer too, so I'll have to add this to one of our meals! That looks so yummy and totally something I could see myself making! 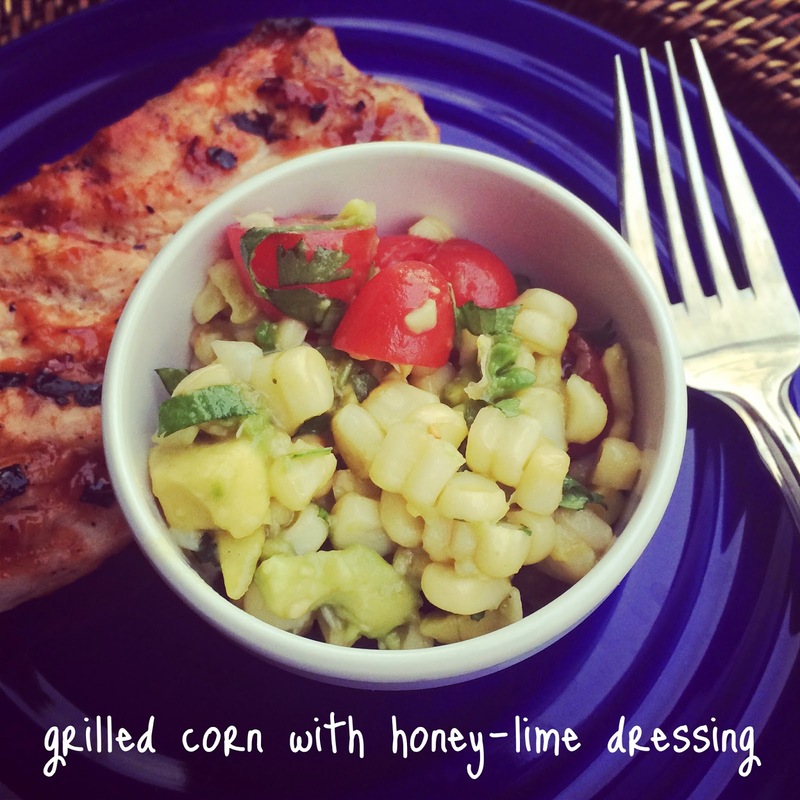 I can't get enough fresh grilled corn in the summer...thanks for the new spin on it! I love grilled corn on the cob, so I'm sure I'll love this salad. Honey lime dressing?! Yes please!! The dressing with a twist of lime sounds fantastic!